The team began to steadily improve over the next four years under the tutelage of coach Epps. The 04-05 team improved the team’s record from the previous year to 14-16 in the regular season. A group of “ballers” who called themselves ATM (Daniel Dong-young Kim, Richard Lee, Timothy Choi, James Lee, Haebin Park, Kildong Kim, and Joseph Rhee) emerged as freshmen as well as the promising sophomore, Joseph Choi, and were committed to making the basketball program a priority all year round. This group of young bucks was led by senior captain John J. Kim. The commitment paid off as the team finished in 2nd place in KAIAC Division II for the regular season and the tournament. Joseph Choi once again received all-conference honors. It was this year that a rivalry began between ICS-Seoul and Pusan American School. 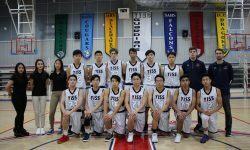 While Pusan captured the title in both the regular season and tournament, ICS did get a game on them when James Lee, as a freshman, came off the bench and hit 4 three pointers in the 2nd half to seal a win. It was also this year that the team pre-game cry became “Family,” emphasizing their relationships to each other and God. The team continues this chant before games to today in honor of the family that the team has become. The boys also traveled to Far East in Iwakuni, Japan to test the international waters for the first time.